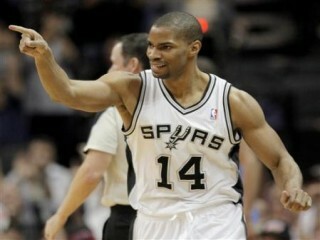 Gary Neal is an American professional basketball player currently playing for the San Antonio Spurs. He is from Aberdeen, Maryland. He is also a former Towson Tigers and La Salle Explorers basketball star. He is 1.93 m (6 ft 4 in) tall and weighs 95 kg (210 lb). Neal is considered a combo guard. Has spent the past three seasons playing overseas in Italy, Spain and Turkey … played on the Spurs 2010 Summer League team … led the team in scoring, averaging 16.0 points and 2.6 rebounds in 25.8 minutes while shooting .500 (30-60) from the field and .500 (17-34) from beyond the arc in five games. Split the season playing for Benetton Treviso in Italy and Unicaja Malaga in Spain … in Italian League play appeared in 22 games, averaging 19.4 points, 4.1 rebounds, 2.8 assists and 2.0 steals in 32.9 minutes while shooting .628 (108-172) from two-point range, .371 (49-132) from three-point range and .800 (64-80) from the foul line … saw action in 11 Eurocup games, averaging 19.3 points, 4.3 rebounds, 2.5 assists and 2.1 steals in 32.2 minutes … completed the season playing in 10 games for Unicaja Malaga in the Spanish ACB League … averaged 12.6 points and 2.3 rebounds in 19.9 minutes while shooting .571 (28-49) from two-point range, .408 (20-49) from three-point range and .588 (10-17) from the foul line. Started his college career at La Salle before transferring to Towson for his final two years … averaged 25.3 points as a senior (fourth in the nation) … earned All-CAA First Team honors as a senior and All-CAA Second Team honors his junior season … was the All-Atlantic 10 Rookie of the Year in 2003 and was named to the All-Atlantic 10 Second Team in 2003 and 2004 … in 49 games at Towson, averaged 25.6 points, 4.1 rebounds, 3.3 assists and 1.55 steals … set Towson’s single season scoring record with 810 points as a senior … in two seasons at LaSalle, saw action in 57 games, averaging 18.3 points, 3.7 rebounds and 2.0 assists … is one of only three players in NCAA history to score 1,000 or more points at two different schools (1,254 – Towson and 1,041 – LaSalle). Led Aberdeen High School to a 21-4 record and a Maryland State Class A championship his junior year … scored the game-winning basket … transferred to Calvert Hall for his senior season … the people he most admires are his parents ... favorite actor is Denzel Washington ... favorite musician is Jay-Z ... favorite meal is a cheeseburger at TGI Friday’s ... most memorable experience to date was winning the Class A state championship while at Aberdeen High ... the youngest of three boys in the family ... son of Gordon and Janet Neal. View the full website biography of Gary Neal.